Home / Residential / Internet service / Ontario / Cable Internet "R"
Cable Internet plans are your best option for highest attainable speeds in this area of service. Cable “R” stands for the first letter in the main service providers name as we must identify the correct backbone. The Internet service runs on a shared network, therefore not linked to outages. In conclusion, the technology in addition to the way the modem is approved on the network keep you running. Free installation on all Internet plans below | March and April only! Click on a plan below to see your available purchase options. 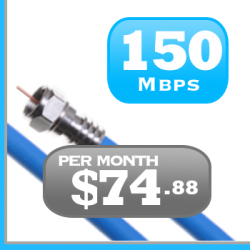 Existing subscriber and not paying this price? Click here!